You can register new domains through Sitejet or you can point existing domains to Sitejet. To register a domain through Sitejet, add a domain to the website you want to publish and click on Register. 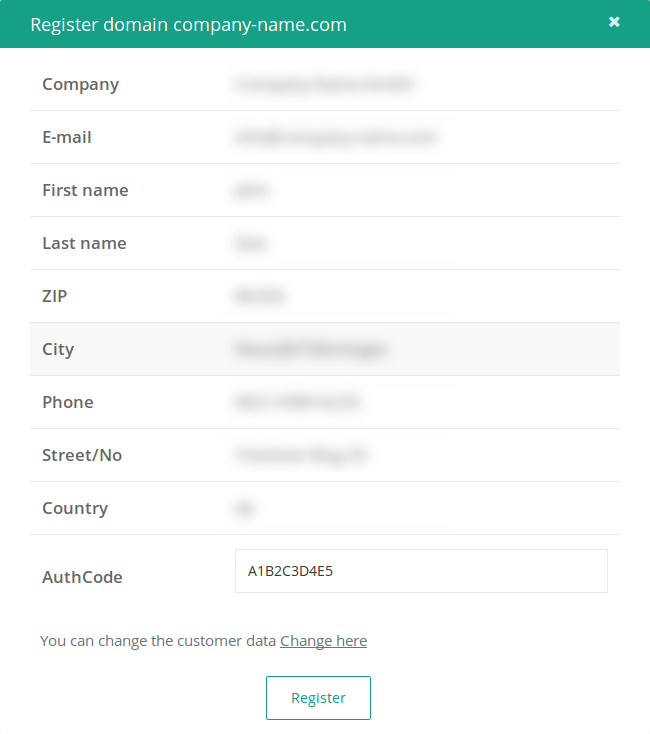 Before you actually register the domain, make sure that the customer data is correct. This data will be transmitted to the domain registry and this is also the owner of the domain. If you already have a domain that you want to publish your website onto, you also need to add that domain to the list (see above). But instead of registering the domain, please set the following DNS settings for the existing domain. Please keep in mind that changes to the DNS can take up to 24 hours to take effect across the internet. Just mark the checkbox "SSL" on any domain to automatically obtain and install a SSL certificate, so the website will be served through a secure HTTPS connection. Note: Issuing a new certificate can take a few hours. Until successful certification, the website will still be served through a regular HTTP connection.